Blondie and Brownie: Zabar's Toasting Bagel Giveaway! There are few foods as quintessentially "New York" as bagels. And there are few shops as quintessentially New York as Zabars, the 70+ year old Upper West Side institution. While bagel-love may spread across the nation, let's face facts, it's not easy to get a great bagel outside of the city. 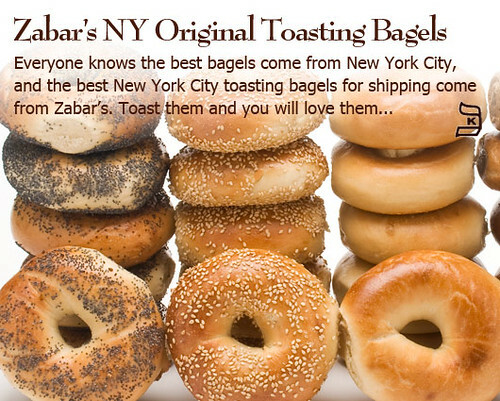 So when the folks at Zabars.com offered to give us two orders of their toasting bagels for our readers, we had to say yes! So, how do you win an order of toasting bagels? Leave us a commenthttp://www.blogger.com/img/blank.gif telling us about your favorite bagel toppings. How do you like your bagel? (I'm rather partial to lox or lox spread myself). You can get a bonus entry by liking us on Facebook and posting your response to our wall (if you already "like" us you can post to our wall and still get an extra entry). I'll come back and pick two winners at random (via random.org) so if you don't leave your info or some way to contact you, please come back Tuesday AM to see if you're a winner next week! UPDATE: To clarify, one of the winners will be from Facebook and the other from the comments below. Good luck! Fine print: Winner must live in the United States. Bagels will be shipped directly by Zabars. We were not compensated in any way for this post. everything bagel toasted with a thin layer of cream cheese and lox. :) yuuum! i like mine with almond butter. Toasted sesame bagel with butter, greens egg, extra sharp cheddar, and strip of veggie bacon = best Saturday morning treat! Sesame bagels with cream cheese! Love my everything bagel with a veggie infused cream cheese (the CA girl in me always shines through). everything bagel almost burnt with butter. Vegetable cream cheese is my favorite. I've never had a Zabar's bagel! Would love to try and share with my family. Cream cheese is my favorite. I have never tried a Zabar's Bagel but I am sure that they are wonderful. mmmm toasted poppy with lox spread and sliced tomato. i just ate lunch and now i'm hungry again. ooo or everything with hummus and cucumbers! Sesame bagel (not toasted) with scallion cream cheese. An everything bagel with veggie cream cheese! a fresh cinnamon raisin bagel, straight out of the oven, with a dab of butter that melts right away! Toasted everything bagel with CC and Amish market jalapeno jam! I love my cream cheese plain, slathered on nice and thick. Yum! I love most bagels with cream cheese and lox. For some reason, I prefer rye bagels with butter. I usually go top(ping)less, but if I'm not paying for it, I'll gladly pile on some smoked salmon or whitefish onto an Everything or Garlic bagel. an everything bagel (or onione) toasted with Cream Cheese and Lox. Thats the way to do it. Lox, tomato, onion, and capers - hold the cream cheese! I like toasted everything bagels with cream cheese or butter. Tiny bit of mayo, parsley, lettuce and tomato. Yumfest 4000. Scallion cream cheese, tomato, onions, smoked salmon and capers. For sure. I like everything bagels with just about any kind of cream cheese. Wow, thank you for such a great giveaway! My favorite way to eat bagels is lightly toasted with Nova and lots of capers! I like toasted everything bagel with veggie garden cream cheese. Oh my! @Carmen: you win! Please email us at: blondieandbrownie[at]gmail.com with your email address and shipping info so we can pass it on to Zabar's. Thanks to everyone for participating!